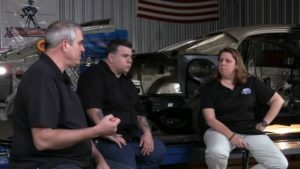 Collision Hub CEO Kristen Felder said it’s important for shops to go beyond knowing that an OEM doesn’t want used quarter panels to understanding why they don’t. Referring to a position statement without that foundation means “you’re already at a losing place” during a negotiation, she said. “It’s not really about an OEM position statement,” she said. “It’s all about the why,” Vehicle Collision Experts CEO Mark Olson said. Knowing why involves consulting the OEM repair procedures for a quarter panel replacement. How the OEM built the vehicle and how you fix it might not be the same, and a repairer can’t assume that duplicating what they saw on the vehicle will work, according to Olson. One has to check the OEM repair procedures. “It’s not up to the technician to decide,” Felder said. Olson said that resistance spot welds produced by tools in a shop are often smaller and not as strong as those delivered by factory equipment. Thus, OEMs require shops to add more in certain cases to be safe, he said. The 2015 Honda Civic featured in the show had a location with 18 factory welds but a requirement for 20 in the aftermarket, according to Olson. P&L Consultants co-owner Larry Montanez said OEMs typically require repairers to put their spot welds next to the factory ones. A spot weld atop a spot weld tends to be called for in instances where there’s three or four layers, he said. Olson said Volvo will sometimes require a shop’s spot weld over a factory weld — unless it’s structural. 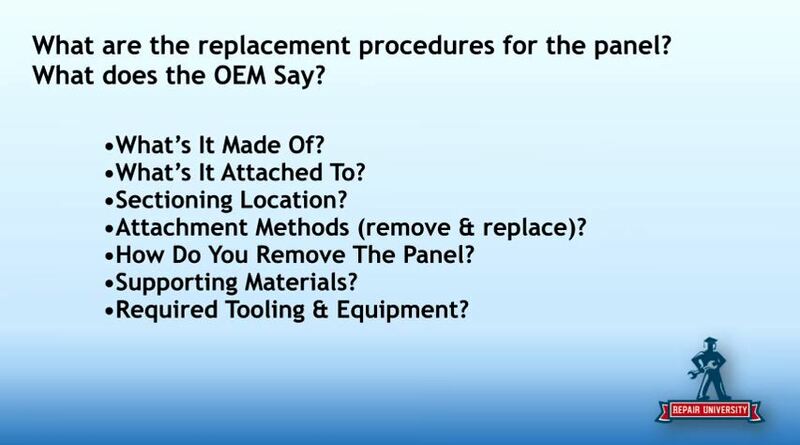 Felder pointed out that when an OEM issues such instructions, it assumes the repairer is using a new panel, not a donor one with a weld nugget. Why all the fuss about quarter panels? For one thing, in contrast to the Insurance Institute for Highway Safety view that quarter panels are typically cosmetic, P&L Consultants co-owner Larry Montanez said he knew of at least four OEMs that specifically called the components structural. Olson suggested the notion of a quarter panel being nonstructural would be proven wrong by crashing a vehicle without one. “It’s a secondary or tertiary structural component,” Montanez said. Often, a trunk floor wasn’t structural, but the absence of one would lead to the back of a vehicle twisting around, according to Montanez. It’s a matter of overall torsional strength instead of collision strength, he said. Also, there’s the basic matter of repair quality. “I’m not fixing cars to make it to the next trade-in,” Felder said. Fix them for the lifetime of the vehicle. As hopefully repairers are aware of by now, heat starts to matter when one is repairing vehicles made out of metals beyond mild steel. This consideration can preclude a used quarter panel. Montanez explained that OEMs allowing MAG plug welding have a diameter limitation, often an 8 mm hole on the outer panels. The concern is how much of the weld expands past that area, such as an 8 mm hole with a 10-12 mm circle around it. The heat radiating from the weld can affect the inner panels, and perhaps a crucial higher-strength steel reinforcement has been compromised, according to Montanez. Heat from MAG welding can crystallize ultra-high-strength 1,500-megapascal steel, making it stronger but more brittle, he said earlier. Olson said any holes drilled in a used quarter panel might be 10 mm, perhaps 10.5 after deburring. As the OEM wants only 8 mm plug welds, it’s officially impossible to deliver the repair with a used quarter panel, according to Olson. Your plug weld will be too large. It’s not just “‘Go big or go home'” where a bigger weld is safer, Felder said. It actually can be the opposite. Olson said technicians sometime will say, “‘When this thing gets hit, it’ll never break,'” but it’s not about over- or underengineering the part. It’s putting it back “exactly the way,” he said. If something goes wrong, investigators will “go right back to exactly how they (the OEM) said to do it,” said Olson, who testifies as an collision repair expert witness in litigation. Montanez also challenged the amount of heat produced during the removal of the used quarter panel and its installation on the customer’s car. Drilling the quarter panel off creates heat, as does deburring it, according to Montanez. Sanding inside and outside thins the metal, and welding it on creates more heat, he said. A used quarter panel has been heated or tempered multiple times, more than would happen with a new quarter panel, Montanez said. “You can change the metallurgical properties of this particular material,” he said. “How you take the part off the car determines, in a lot of cases, what kind of part you can actually use,” Olson said. On the Honda Civic featured on the show, for example, a used quarter panel wouldn’t work because there’s no way to drill it from the backside and have a panel to weld to, according to Olson. If a quarter panel was installed with rolled hem flanges, there’s no way a used one would work, according to Olson — a point I-CAR drove home last year with its position banning reusing such quarters. It’s been work hardened, and it would be work-hardened again during the unrolling and rerolling, according to Montanez and Olson — just like twisting a paper clip multiple times weakens and eventually destroys the metal clip. Montanez said some repairers attempt to be sculptors, but “what’s the longevity of that repair?” What happens when the metal expands and contracts further naturally because of the area’s climate, he asked. And falling back on the justification that “‘I don’t have comebacks,'” was nonsense, she said. Maybe the owner didn’t bother, she said, giving the example of getting an incorrect drive-in order but opting not to return to the restaurant. Or perhaps the car was sold to a new owner, she said. 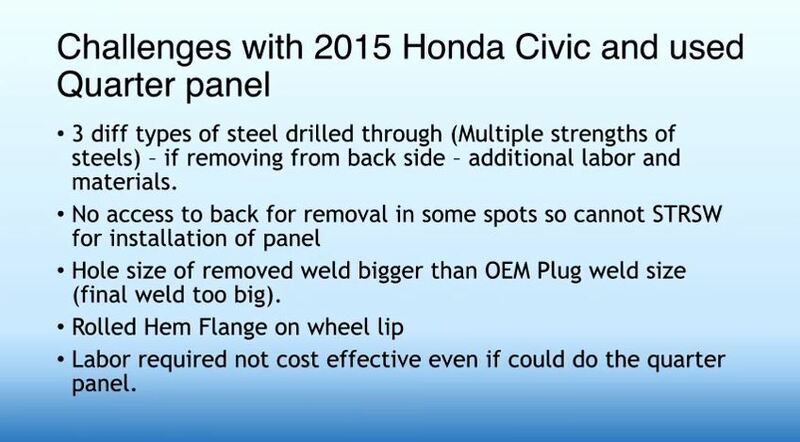 A shop can’t squeeze-type resistance spot weld the Civic quarter panel as Honda wants, the holes for MAG plug welding on the used quarter violate OEM parameters, and there’s a rolled hem flange on the part, Felder summarized. “That’s like three strikes,” she said, though based on the show, any of these would be enough to declare a used quarter panel impossible to install. If an insurer or repairer couldn’t explain why a used quarter panel could or couldn’t be used, “It kind of scares me,” she said. Any adjuster, automotive professional or claims manager should know this, Felder said. Another benefit: “It arms your customer,” Felder said. Even if they take the car to a competitor, they might be able to advocate better for themselves. Felder also issued a challenge, saying they’d love to see an example of an OEM where a used quarter panel could be applied. Olson said that such a thing might exist in cars from the 1970s or earlier, but they’d probably be total losses anyway. Felder said she wasn’t trying to knock recycled parts, noting that some indeed had a value and place in the industry. But in this particular application, she said, there’d never been a non-restoration instance in her 20-year career where a used quarter panel would work.